Triangle Cross Ranch offers an alternative to wilderness programs – The Triangle Cross Ranch Frontier Adventure Program for troubled youth that is a therapeutic outdoor adventure program organized around Christian ideals. It is year-round, with a minimum stay of sixty or ninety days. Triangle Cross Ranch is situated in the majestic Sunlight and Big Horn Basins of the Absaroka Range in the greater Yellowstone Park ecology system near Cody, Wyoming, this frontier styled camp for troubled teens is broad-based, flexible, and incorporates a rich variety of activities, not just hiking and camping. It is an integral part of a working ranch encompassing 40,000 acres; all aspects of ranch life and mountain life are fully explored. Through our motivation and positive Love And Logic approach to behavior improvement process at Triangle Cross Ranch, troubled youth learn the lessons of cause and effect, the natural consequences for their actions, and a solid work ethic. Therefore, all troubled teen frontier activities, schooling, and counseling are geared to teach these experiential lessons. Back country nature expeditions and exploration, range management, mapping noxious plant locations, building and repairing fences, repair natural water springs at “cow-camp”, cowboy-ing, carpentry, horsemanship, and hiking are some of the projects the troubled youth may encounter in our Triangle Cross Ranch Frontier Program. Triangle Cross Ranch’s frontier activities not directly related to the upkeep of the ranch may include individual study courses in our schools for troubled teens, includes a dimension of animal therapy, in which each of the troubled teens get to work with and care for many different animals. This work is real and the challenges it presents are real. In accomplishing it, the troubled teen gains a sense of worth, confidence, and self-esteem. At Triangle Cross Ranch we believe our Frontier Adventure Program is truly unique. Something inexplicable happens to the troubled teens that undergo our program. Not only are they affected by the beauty and serenity of the mountains, but their self-imposed barriers disappear. Healing is accelerated with the help of God’s beautiful creation. Combining one’s life with prayer and living closely with nature, the students’ life is simplified, his senses slowed down, which provides room for contemplation and reflection. The at-risk teens begin to understand how they are viewed by God in His creation. In the outdoors there are neither rewards nor punishments. There are only consequences, and nature cannot be manipulated. 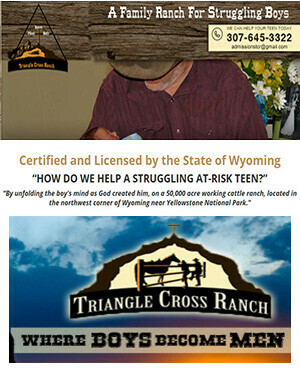 The Triangle Cross Ranch Frontier Adventure Program is not a “teen boot camp” or “behavior modification program” for troubled youth. It is our desire to instill excellence and to allow each young man to achieve his fullest potential. We are not merely “fixing” the student. Each child is unique and requires much individual thought, attention, and prayer. The staff considers it their privilege and calling to work with these at-risk teens therefore, they are committed, recollected, and avidly interested in each student. Unlike other troubled teen camps, our students partake in daily prayer and scripture readings, and are enrolled in an accredited Independent Study courses on character and values. Triangle Cross Ranch Students have the option of taking these other independent study courses: study skills, leadership, creative writing, algebra, technical writing, and life skills preparation for responsible adulthood through our school for troubled teens. Triangle Cross Ranch Students are continually being prepared for transition out of the Triangle Cross Ranch Frontier Adventure Program through activities aimed at teaching what real happiness is. They are challenged daily to question their decision-making processes, to question their motives, their past mistakes, and to make vital connections concerning how lessons learned in nature today can be applied at home tomorrow. Our Triangle Cross Ranch Frontier Adventure Program is designed to bring to surface the fundamental character of a young man. His life is simplified, stripped down to bare essentials. No personal possessions are permitted, food is simple and healthy, work is challenging and living conditions rugged. Like a teen boot camp, the day is well-ordered, begins early, and is divided into school and work times. Morning and evening prayers are said. Young men are expected to be obedient, respectful, and attentive. Most activities are communal and are always closely supervised. The expeditions and work can be strenuous and students will need to be in reasonable physical condition. They should be able to carry at least 40 lb of weight and do physical work. They should be able to run at least one mile per day. Rest days will be included in the schedule should any students have trouble adjusting to altitude. The terrain will vary from 6000-10,500 ft. Our staff are CPR/First Aid trained and the Cody, Wyoming Hospital is our sponsoring medical organization. They provide all emergency medical services for Triangle Cross Ranch. Do you know an at-risk teen? Call Triangle Cross Ranch for more information SHIthic that will help them be successful in holding down a job or continuing their education. For more information on how we may be able to help your son, please call us at 307-645-3322.